She has the support of a multitude of people, but ultimately will have to face the IAAF alone. In a way it was fitting that Caster Semenya was – with the exception of the obligatory two lawyers flanking her for these occasions – all alone when she turned up in Switzerland on 18 February to appeal against the International Association of Athletics Federations’ (IAAF) proposed eligibility regulations for female classification. The two-time Olympic 800m champion and three-time world champ’s ears may have rung with the support of a multitude of people ranging from legendary tennis player Billie Jean King to the ordinary man on the street when she arrived at the Court of Arbitration for Sport (CAS), but her battle to continue being classified as a woman and carry on competing as one has always been about her. Indian sprinter Dutee Chand’s successful appeal against what can be termed the first draft of the IAAF’s attempt to exclude women with hyperandrogenism (higher than normal levels of testosterone) from competing against women without the condition gained Semenya a reprieve from having to take medication to suppress her testosterone production. But the fight is now all hers. The thing is, the 28 year old has never outsourced a fight, and the scrap with the IAAF, which began with the court appeal stretching from 18 to 22 February and culminates in a result around 29 March, is part of a series of tussles she has had to overcome throughout her career. From day one, when she literally came from nowhere to win the 800m title at the 2009 World Championships in Berlin, Semenya has had a decade-long battle to have her otherness accepted, be it by the sport’s administrators or her competitors. At the time, she had to put up with opponents who pointedly refused to shake her hand when beaten and openly sneered to the media about being forced to compete against “a man”. She also had to deal with a governing body whose insensitive reaction was to subject her to the degradation of a gender test before handing over her gold medal. One can only imagine what going through that as a teenager, an understandably angst-ridden time in anyone’s life, must have been like for Semenya. But there she was, the only person behaving with maturity, dignity and strength while the adults were knee-deep in using an intensely private matter to win cheap political points. And from that day on, having to consider more than just responding to the early morning alarm to train so she could be in the best possible shape to compete became a constant companion in Semenya’s career. If it wasn’t competitors like Britain’s Lynsey Sharp ignoring Semenya and tearfully consoling the other athletes making up the lower placings in finals, the South African had to worry about what new regulations the IAAF – having responded to her first global victory by forcing her to take medication to dull her one unusual but natural advantage – would introduce next to exclude her from mainstream athletics. After a period in which she was stood down for 11 months before returning to the sport sluggish and seemingly performing through a dense fog because of the medication, the answer finally came last year when the IAAF had a second tilt at her with new eligibility regulations for female classification. The new regulations, which would have kicked in on 1 November last year had Semenya not decided to challenge them at the CAS, seek to compel female athletes with testosterone levels above the threshold of 10 nanomoles per litre, which the New York Times described as being at the lower end of the male range, to take certain remedies to be classified as female competitors. The more eye-catching of those remedies were: scratching the athlete from female events at an international level, taking medication to lower testosterone levels, competing in men’s events or their own relative leper colony of “intersex” competitions. Scientists don’t agree on what is ethical and fair in cases like this, which is ironic as the IAAF has turned to science to “protect the sanctity of fair and open competition”, according to its president, Sebastian Coe. But the IAAF’s biggest issue is that after having been told to bolster the research that led to Chand winning her appeal in 2015, their new findings have been questioned by scientists. Tucker and fellow sports scientists Roger Pielke and Erik Boye wrote to the British Journal of Sports Medicine last year requesting that it retract the research study upon which the IAAF’s resolution to enforce its new eligibility rules was based. Apparently, in sports medicine speak, asking for that retraction was going the sledgehammer route to criticism, but Tucker and co feel justified in doing so because it was “affected by significant data errors and problems … we found between 17% and 33% of the data was flawed or erroneous”. In retracing the IAAF research’s footsteps on 25% of the original data, the main issues uncovered by Tucker and his colleagues were duplicated athletes (more than one time included for an individual), duplicated times (the same time repeated once or more for an individual athlete) and phantom times (no athlete could be found with the reported time for the event). The ultimate irony may well be that the IAAF has inadvertently helped fan the embers of Semenya’s ambition, which could have been on the wane after winning pretty much everything there is to win in the sport in the past 10 years, by giving her a new point to prove. Perhaps the reason South Africans are so up in arms about Semenya’s situation is because of what her success has come to mean for them. In the past decade, she has evolved from an awkward, defensive teenager to someone perfectly at ease with herself, which has been an example to us all about how to negotiate our way through a murky underworld like our country, where change is the only constant. And by marrying a woman when most people – especially someone from a village like Ga-Masehlong in Limpopo, a place most of us would have expected to judge her – would have been browbeaten into pretending they preferred men, she has silently encouraged others to be true to themselves and their convictions. Semenya has limited her responses to pointed tweets. But few things speak more on her behalf than the powerful Nike advertisement she did in the immediate aftermath of the announcement of the pending classification changes. 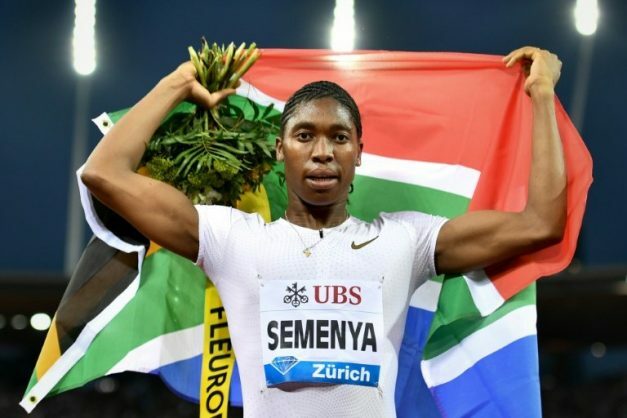 The championship rounds of Caster Semenya against the IAAF – a young woman comfortable in her skin and an organisation uncomfortable with her very existence – have just commenced. This piece was first published by New Frame.